Cutting down on meals isn’t the answer to getting in shape, it’s watching what you eat and eating the right things that will fill you and provide the energy that you need. The vegan wrap selection platter will provide you with fantastic ingredients, like avocado, jackfruit and butternut squash to give you all the good stuff. 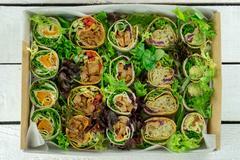 The platter includes 5 vegan wraps, all with different fillings to satisfy everyone’s taste buds. 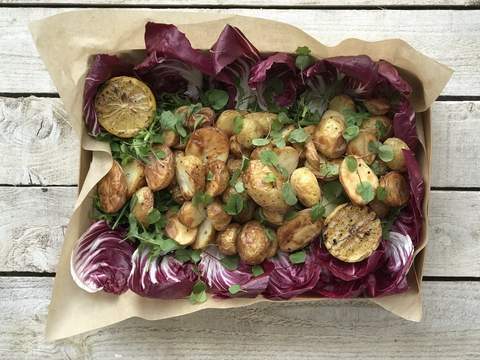 Potatoes are a great source of energy, as well as being a great source of nearly half your daily value of vitamin C, so why not choose the rosemary roasted baby potatoes individual platter. This is a great side platter suitable for 10 people. Choose Salad Days every time for your office lunch needs.